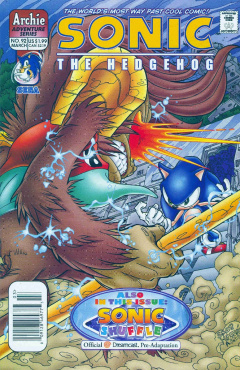 Sonic the Hedgehog 92 is the nintey-second issue of the Sonic the Hedgehog comic series. It was released in March 2001. This comic features two stories: "The Wrath of Khan" and "Sonic Shuffle: Premonition". "After ten long years, the iron-fisted rule of DOCTOR ROBOTNIK over planet Mobius was believed to have finally ended! With the technological tyrant vanquished and his polluted factories shut down, order and beauty were restored to the city of MOBOTROPOLIS. Now the villain has returned to wreak havoc once more, but there are many who are willing to stand against him in the fight for freedom. The bravest among them is a brash, blue streak who just happens to be the fastest thing alive!" After the prologue, the story opens with a veiled figure wandering through the desert towards Robotropolis. The scene then shifts to Eggman within Robotropolis, whining about the theft of the Sword of Acorns that he had recently nabbed from Sonic. In the desolation of the Forbidden Zone, Sonic is mulling over the significance of what he once thought were meteorites, but were actually UFOs. A squad of Overlanders emerge, with Lady Agnes questioning Lord Kintobor as to why they landed in such a wasteland. An officer by the name of Cheddermund explains that their ships' coordinates were set to land near the largest urban center on the planet, before being interrupted by a young girl named Hope squealing at the sight of an animal: Sonic. Sonic then fights off a Combot for them, in spite of their mistrust. In the Knothole Kingdom, Geoffrey is causing a commotion. Someone has stolen the Sword of Acorns! Rotor chimes in that he and Mina had just seen Sonic heading off to retrieve the sword. Mina then begins coughing to dissuade Geoffrey's incessant badgering. Back at Robotropolis, Eggman is viewing the scene in the Forbidden Zone on his monitors. He reminisces about having roboticized his brother Colin (Lord Kintobor) in an alternate reality, and plots to lure the Overlanders into trusting him so he may do the same again. In the Forbidden Zone, the Overlanders are debating whether or not they should be trusting the hedgehog before them. Just then, an hologram of Eggman appears, advising the visitors to trust him and his robots instead of the menace that is Sonic the Hedgehog. Monkey Khan then drops in attempting to assault the hologram, as Eggman urges the Overlanders to make a run for Robotropolis. Back at Knothole, Geoffrey is attempting to interrogate Mina, to no avail. Hershey insists that Geoffrey leave the room to allow her to get the information out of Mina. Hershey succeeds offscreen, and is thanked by Geoffrey, who exclaims, "Hershey, I could kiss you!" He does not, however, much to Hershey's dismay. Khan and Sonic are duelling in the Forbidden Zone. Sonic is attempting to reason with Khan, but Khan is enraged. Khan explains how Eggman and his robots razed his village and roboticized everyone. Sally is elsewhere in Knothole, conversing with her mother. Queen Acorn asks her about the hardships of presiding over Mobotropolis when Eggman came posing as an ally and proceeded to sack the city and roboticize most of the inhabitants. Sally mentions how her father was banished during those turbulent times, and the remaining citizens fled to Knothole. When pressed by her mother, Sally affirms that she was the one in charge. Outside of Robotropolis, a Combot approaches the still dueling Sonic and Khan. Sonic ditches the fight with the Khan to rush to the rescue of the Overlanders before they enter the city. Unfortunately for Sonic, he was too late and the energy dome shielding it was already back up. Sonic is running down a railroad track, until he bumps into a peculiar emerald. He is taken aback by the emerald, as it did not appear to be a Chaos emerald. Suddenly, Amy, Tails, and Knuckles appear before him, along with an unfamiliar face; Lumina. She explains to Sonic that she is there to guide him on an important adventure, but he believes himself to be within a dream. She assures him that the situation is real and dire, with the fate of multiple dimensions at stake. More importantly, her dimension of Maginaryland is in grave danger. She urges Sonic to approach and touch the emerald, now revealed to be the Precioustone. When he does, he awakes from his dream to find this to truly be reality. This page was last edited on 28 March 2019, at 17:50.